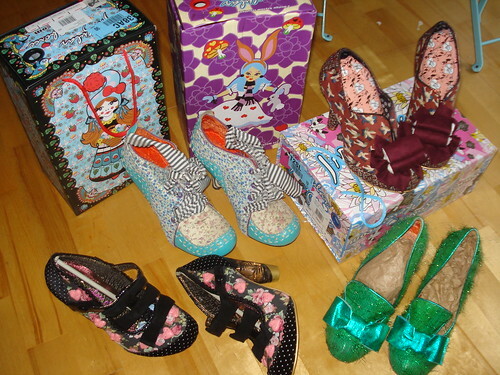 t*rexes and tiaras: sunday shoes 020: irregular choice haul.. Naturally, I got home from Guide Camp last Monday to find a heap of parcels waiting for me. 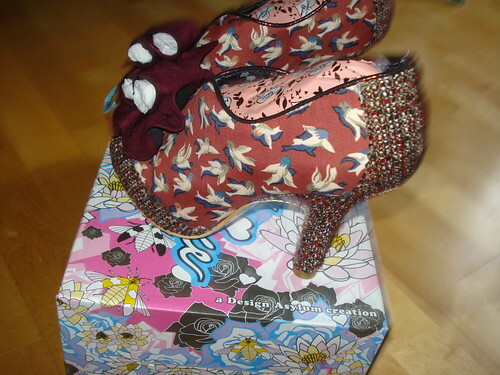 I have to admit I've had quite a bit of luck with eBay lately, managing to bag some bargains and cross some of the pairs of my perpetual Irregular Choice wishlist. I've also had a nice delivery from Spartoo, containing a couple of the new season pairs which I'd had my eye on for a little while. These blue boots are, strangely enough, my first and only pair of Abigail's Party, which seems mad really, considering how many colours and styles they've done. I've just never really liked any of the others, but when I saw these in Schuh a couple of years ago I added them to the list of pairs I'd like. I was quite pleased to pay less than £30 for them, all in, and for them to arrive in almost perfect condition. For me, I think Autumn is all about layers and pretty fabrics, and tweed is always one of those, so no prizes for guessing what drew me to Hook Line + Sinker as a style. The bird print is cute, although I've never been a *huge* fan of swallows, they're quite cute on this fabric and I like that the other colours are quite neutral. I think they'll be really versatile and imagine I'll get a lot of use from them in the coming months. Ah, the imaginatively-named Oz. I'm not sure what made me unsure about these, because now I've got my hands on a pair, there isn't anything I don't like about them.. 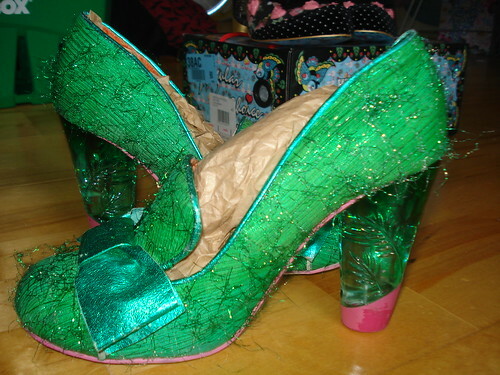 They're the same base model as Bowtiful, Rocko, etc with their chunky perspex heel, but in a nice, bright green with a shiny bow and glittery tinsel. I guess they look quite festive. 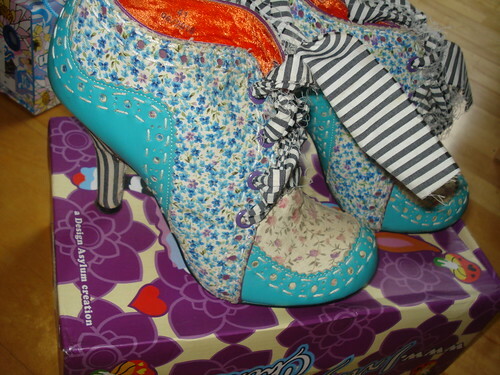 Love Magic are the first pair I've been tempted by with the button-charm details on. 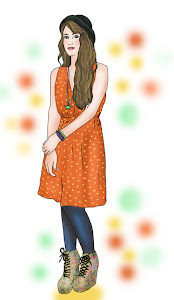 I know they're not the first style to have these, but in the past I've found the rabbit, bird or whatever else buttons looked a little too childish for me. I think the hearts on this pair work much better because they're matched nicely to the base fabric, and I really like the mix of materials used with the polka dot velvet at the fronts and backs. And of course, the perspex heel. Again. The Love Magic ones are gorgeous! Love them all, glad you finally got hold of some Oz. They're all beautiful! 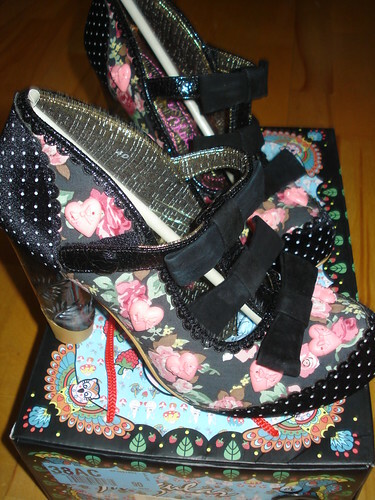 I love Irregular Choice shoes and want to start collecting. The blue and black pairs are my favourite. 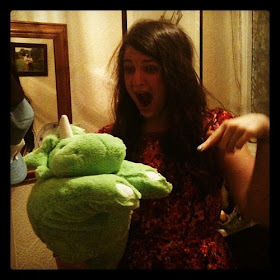 Lucky thing!